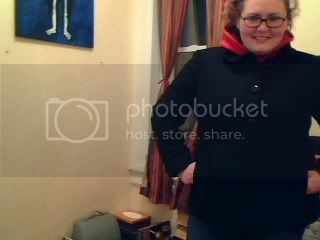 My sister bought this coat for herself but it didn't fit her properly, so when I was in Connecticut, I tried it on and adopted it right away. I think it would be safe to say that I am in love with this coat. I've never had "cute" clothes - clothes for me have always been functional; as long as something fit, I bought it, and I'd get it in five different colors to keep me good for a while. This coat feels like success to me, and I love how happy I feel just wearing it! Lots, actually! (1) As of Friday's weigh-in, I'm nine pounds away from my 100 pound weight loss! (2) I've been running, not as much as I should have, but between coming back from Connecticut and forgetting that the gym has winter hours, I've been thrown off a bit. Spring hours resumed yesterday, so I'll be back on track this morning! (5) I tried a new fruit! Persimmon - loved it. (6) I went to the Art Institute on Thursday night - a lovely retreat from the cold! My favorite is the Impressionist section. (9) I did a mud masque and just relaxed the other day - it was so dreamy. I've been pretty busy with trying to get back on schedule lately, so it was nice to just sit and enjoy my own company for 20 minutes. Though it seems like the easiest, I think the hardest one for me will be doing something every week to make me feel gorgeous. I tend to get very wrapped up in my work and fixate on one thing at a time, so to have to put aside a little time every week to do something just for myself? Tricky! For some I do - like training for the 8k. I'm running the race with a friend of mine from work, so we have been going to the gym together. Are you a planner when it comes to meeting your goals, or do you tend to "wing it" and hope for the best? Planner - always, not just with challenges. I need to have a plan. Who knows about your blog? Are you on blogger lockdown or do the "real" people in your life know about your blog/read your blog? Right now, none of my friends or family have the address, though a few know that I keep a blog. One of the things I am weighing with my decision to possibly move off of Blogger and onto my own site is the idea of building bigger readership, and that might include my "inner circle." I'm really torn over the idea, to tell the truth - if I wrote strictly about what I eat and how much I exercise, that wouldn't be too big of a deal, but I write a lot about the emotional struggles I am experiencing with weight loss. I pride myself on how honest and open I am here, and having friends and family reading might compromise my openness. I understand that sense of logic, Mary. I am weighing the issues of how much I should share/shouldn't share. My family and friends know about my site but no one ever mentions or asks about it. I don't know if this is a good thing or a bad thing: are they reading and embarrassed by it? Or do they just not care? Either way, if the way you are writing is helping you, don't compromise it. BTW, I'm waving at you right now from Chicago! My husband and I stayed near the Briar Street Theater to see Blue Man Group last night. I completely get the open-ness... and wondered how you might respond to the last question...Maybe telling your family might be something you do later on since you're sorting through a lot of that stuff right now and it might hurt them while it's happening but reading it in an archive will likely have another effect. Cute coat and good job with doing something nice for yourself! Great idea! My answer to the last question was the same as yours. Love the coat! Nice coat! Looks good on you!!! :) So glad you have a friend to train with for the 8k! I totally understand what you mean about openness, my family don't know about my blog either and I intend to keep it like that! Lovely coat. Great coat! I'm so proud of you. It did not take you long to get back in the groove, after returning home to Chicago. The Art Institute of Chicago is one of my top favorite museums in the world! It is such a priceless jewel. Goodness, they even had a massive Georgia O'Keepfe hanging in over a stairway landing!